Glasses to go with your new video iPod? The RODE SVM is the choice for filmmakers aspiring to achieve the feel of actually being in a given location. Stereo gives you that ambience. Made of lightweight aluminum, the microphone capsule is suspended via rubber rings to isolate unwanted sounds from traveling up through the camera or boom pole. Traditionally, a shockmount would be a separate item, making the all-in-one construction of the Stereo VideoMic both consumer friendly and unique. It also makes any camera just look pro! Unlike the built-in omni-directional microphone (which hears all around) on many of today’s camcorders, you’ll achieve solid sound rejection from the rear with the Stereo VideoMic, this is great for those instances when you need to “focus” the sound. The SVM is not a super-cardiod mike like a shotgun – it is simply a cardiod mic and therefore less directional. You can however simply position the mic so unwanted sound hits the tail. Sound hitting the rear of mic will not be picked up and because the mic does not colorize low frequency sound entering from the sides like a traditional shotgun, the SVM sounds quite exceptional indoors- even with reflected sound bouncing around in an echoey room. The Stereo VideoMic mounts via camera shoe while also allowing 3/8” threading for attaching to a boom pole or mic stand. 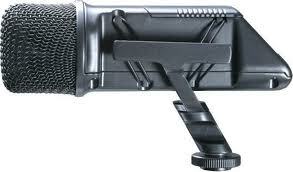 A great way to gather high-quality sound is to attach the mic to a stand and move the ensemble closer to the subject. Use the optional 10’ extension cable to give you even greater reach.The included long-haired windmuff easily ceases a 20MPH wind giving you solid, clean audio even in mild to harsh winds. This simple slip on cover can really save the day where the on-board mic may have produced unusable results. Don’t be the guy who “ruined my audio!”Overall, another solid product from RODE. Studio quality sound at a bargain basement price (and thank you RODE for throwing in free wind protection)! Click this link for a demonstration movie of the RODE SVM. The SVM offers 9V battery operation, an LED battery status indicator, a high pass filter switch & a -10dB pad switch which allows for the mic to be used on most cameras with perfect level control.